Last night, LADOT hosted a well-attended open house sharing the latest findings on the Mar Vista Venice Boulevard Great Streets project. Photos by Joe Linton/Streetsblog L.A.
Last night the Los Angeles City Transportation Department (LADOT) hosted an open house meeting on the Mar Vista Venice Boulevard Great Streets project. The open house was a six-month check-in, with LADOT presenting their latest project data. The event took place at the Mar Vista Recreation Center. The project removed a car lane in each direction for 0.8 miles of Venice Boulevard. The city added parking-protected bike lanes and signalized mid-block crosswalks. These improvements were debuted in May 2017, though in late 2017, the city reworked portions to make driver right-turns easier. Much of LADOT’s six-month data showed relatively little change in outcomes before and after the project was implemented. Overall crashes, injuries, travel times, and even speeding show very little change. Project opponents, including some trolling Streetsblog comments, are quick to cite anecdotal evidence that “accidents” have increased since Venice Blvd safety improvements were implemented. Last night, SBLA watched a couple of complainers pull out their cell phones to show their crash photos to L.A. City Councilmember Mike Bonin. Travel times are, as expected, marginally higher, especially in peak directions at peak times. 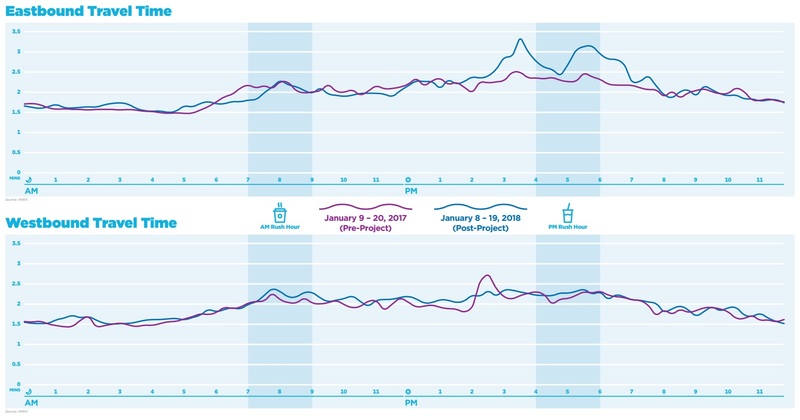 Soon after project implementation, travel time was up significantly during eastbound evening rush hour, though that trended downward in the six-month figures, possibly due to December adjustments made to facilitate drivers’ right turns. Pre-project speed surveys showed non-peak-hour drivers speeding at 41 mph, one mile over the posted 40 mph speed limit. Six month post-project data showed westbound speeding disappointingly unchanged, with eastbound speeds increased to 45 mph. This disconcerting metric suggests that LADOT perhaps needs to slow the street even more to get drivers to obey posted speed limits. What accounts for the inconclusive data? It is not clear. There may be too many fluctuations in sampling a relatively small site. The design might not be as effective as expected. It is also possible that the improvements have kept Venice Boulevard safety more-or-less level, while the rest of L.A. is experiencing an upward trend in miles driven, congestion, crashes, deaths, and injuries. Hopefully, results will become more clear and more conclusive as the project continues to be monitored. With the meeting’s open house format, there was no time for verbal public comments, so it is difficult to assess just how the several hundred attendees reacted to the project and the latest data. More than a dozen bicycles were locked near the entrance to the center, indicating that plenty of bicyclists were in attendance, many presumably in support of the project. Project opponents explaining their critique to Councilmember Mike Bonin (right). A couple dozen attendees were clearly opposing the project; they displayed “restore Venice Blvd” and “give us back our lanes” signs. LADOT plans to do a more detailed analysis to be presented after one-year data is available. There is a difference between anecdotal evidence and crowd sourcing data collection. When you have pictures or LAFD push notifications from each accident you are claiming occurred, that is reliable data, and is much more reliable that picking a choosing what sources you are going to rely on in order to cherry pick data. So sorry Joe and road diet activists, when analyzing the actual number of accidents for which there is evidence they occurred, accidents are up. 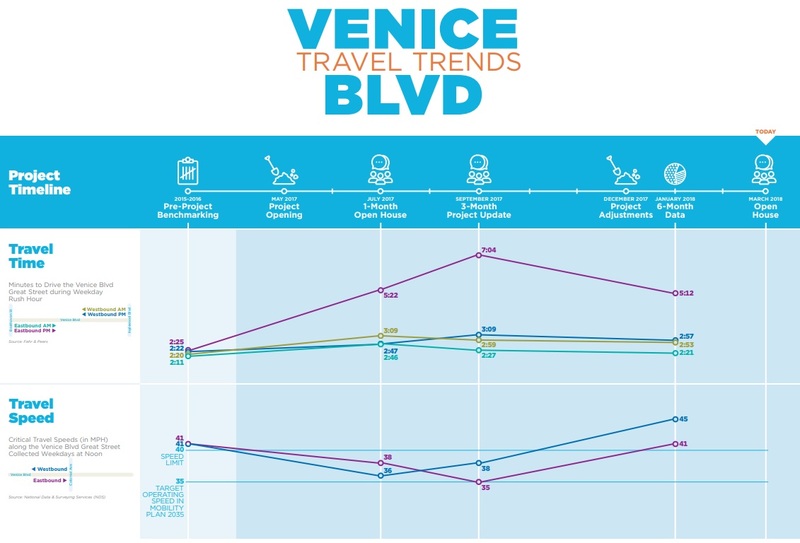 And the travel time data is misleading because it fails to take into account the fact (according to Mike Bonin’s own publications) tens of thousands of cars diverted from Venice Blvd through the residential neighborhoods. So while travel times increased slightly, that is because traffic volume was reduced with a corresponding increase in cut-through traffic. Joe, instead of calling me a “troll” why not interview me and we can talk data. The “anecdotal” data I posted in the comments comes from the CHP SWITRS database. The same database the LADOT called “the standard” for traffic collision analysis. You’ve written about KeepLAMoving so many times but have yet to actually speak with us. Why not sit down and look at what we’re looking at rather than just dismiss it out of hand? So basically, Venice has now been right-sized. Please don’t forget that this project also created signal-protected left turn lanes, much to the benefit of the Motorists who are complaining about this projects. Nope. 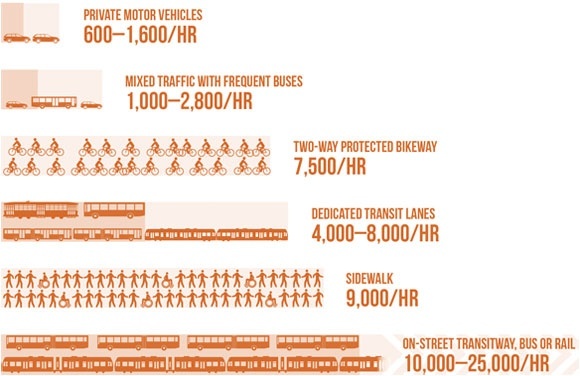 Check out Bonin’s data on the increase in the volume of traffic on the surrounding side streets. One fatality already occurred as a result of cut-through traffic. Bonin moved commuter traffic from a boulevard designed for high volumes of traffic and pushed it onto residential streets. It wasn’t reallocated. It was removed. You probably don’t live anywhere near here so you wouldn’t know that there was already a bike lane. They “removed a motor lane” to add a buffer. You’re not a journalist, you’re an activist who writes opinion pieces. “Reallocated” is a good term to explain that the right of way (“ROW”) between building setbacks was not changed, but that paint was moved within the roadway to re-allocate the intended use of this space (in this case, towards a wider bike lane and buffer from parked car doors) with a different lane configuration. “Removed” would be a term to describe that the ROW was reduced, giving space away from the public right-of-way to property owners. That didn’t happen here. The comment referred to a “motor lane”. There was a motor lane, and now there is no motor lane. That is not a reallocation of the lane as the lane no longer exists. You are correct that they did not remove a portion of the roadway in terms of distance from building setbacks. You are discussing something different. Putting both concepts together, they reallocated the use of the roadway by removing a lane of traffic. Those signaled turn lanes already existed. Again, people who don’t live here telling us how “great” this joke of a project is. I’m so confused, as a “journalist” you don’t want an interview with the group you are writing about???? Ha, thanks for admitting you are lazy along with being biased. Then it sounds like the residential streets also need some interventions to keep cut-through traffic off of them. How are you going to do that besides close them? You can’t do a road diet on a two lane residential road. Barrington at base of Mär Vista hill for nearly a decade. One can make local resident streets fully permeable to cycling and pedestrian traffic, while erecting some barrier that blocks cars from entering or exiting it except at one point (effectively turning them into car dul-de-sacs without any impact on pedestrian and cyclist access). There are abundant examples of that in Europe. 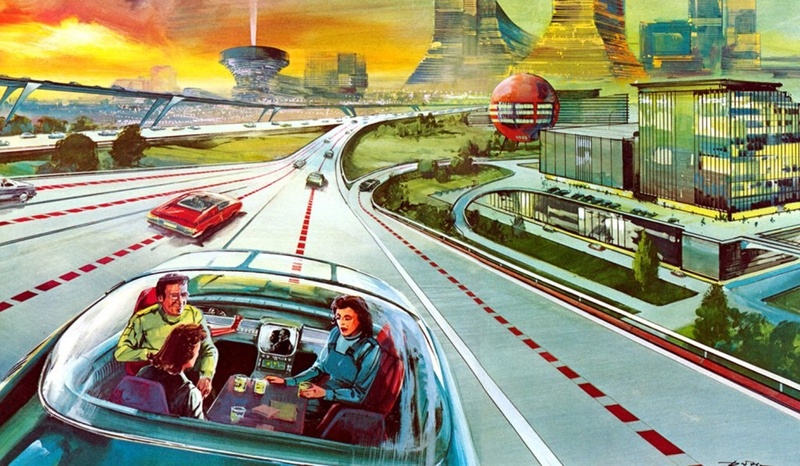 In US, St. Louis has adopted this design (although with nefarious implicit goals of preventing cars driven by ‘those people’ (sic), whom they suspect of ill intent, cutting through their ‘upstanding’ streets with a very specific demographic profile). Actually, a road diet could be done by way of making it a yield street. Otherwise, just put in a couple of diverters to prevent it from being an alternative through route. So basically you’re suggesting that we appease dangerous reckless drivers who don’t care if they commit homicide by changing Venice Blvd back to the way it was, instead of doing something about reckless drivers. Stop calling travel lanes car lanes. There is no such thing as a car lane! There’s no such thing as a motor lane either though. That’s the difference between journalism and opinion pieces. The author, Joe Linton, knows better. The lane was not reallocated, because a buffer is not a lane. Reallocation means you are putting the lane to a different use. So when you say the lane was reallocated you mean the lane is still there but is now used as a different type of lane. For example, if you have a four lane road, you can implement a road diet by reallocating one lane as a left turn lane and removing the other lane, leaving you with three lanes. If a lane no longer exists, versus changing the purpose of the lane, that is removing the lane. Grand View was the only intersection where they added left turn arrows, Inglewood, Centinella and Betthoven already had them. And Wade still doesn’t have them. But it’s a good thing they added them on Grand View which is now a major cut-through street and extremely dangerous. One of the dirty little secrets about this project is that it pushed tens of thousands of cars onto residential side streets and we already had one fatality as a result of it. This project made the neighborhood very unsafe. And considering that, at best, there is no change in accidents or injuries on Venice, this project is a complete failure. So the road diet is inconclusive and now we all have to suffer with tens of thousands of commuters driving through our neighborhood on residential streets. Sounds like it’s time to concede that Venice Blvd isn’t a good candidate for a road diet. Nancy- So you’re now trying to argue — without providing any technical backup to justify it — that a buffer doesn’t represent a use? Even in the example you’re pointing to you’re somehow oblivious to the point that allocation of roadway would be made for bike lanes, curb extensions, or another purpose. Just take the L and move on. Amen. We all have the right to use the public space, no just entitled drivers. So perhaps you shouldn’t cut through other peoples residential streets. Selfish drivers. Diverters and traffic circles work in Berkeley. These are lanes, not motor lanes. …as opposed to Fox News. Maybe the message to everyone who feels that it’s their right to drive everywhere is that there are other options out there. Seems like you all would want to find ways to stop contributing to global warming. Maybe you should talk to commuters who cut through your neighborhood streets. Why do drivers feel entitled to try and avoid the congestion they create? Those weren’t exactly bike lanes, and they made cyclists ride in the door zone. Bus lanes and bike lanes exist, motor lanes do not. A sketch of something that doesn’t exist. Stop being a troll hole. a biker was just hit by a taxi @ Wasatch Ave and Venice Blvd. This intersection is very dangerous, as you can’t see the cyclists as they’re trying to move all the way to the right side of the road. The bike lane here switches from the left side of parked cars to the right side. 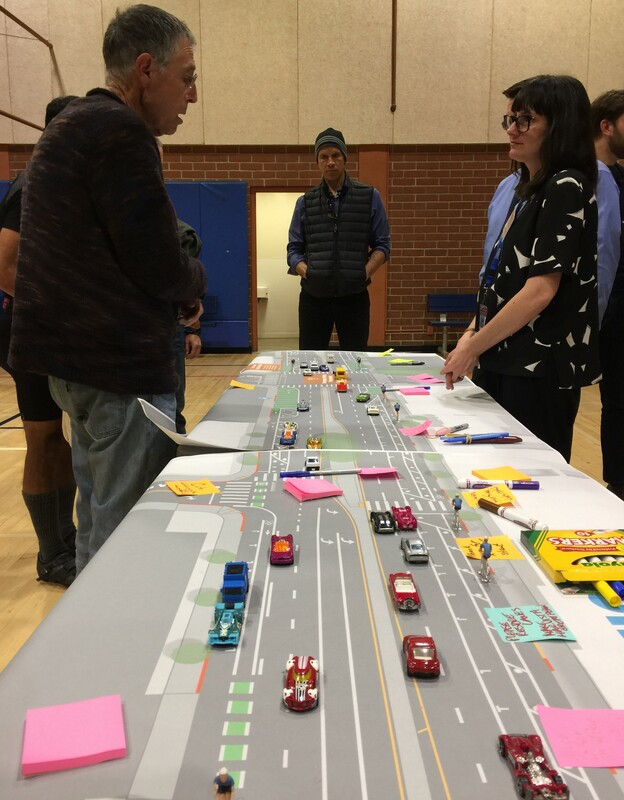 At last Saturday's open house on the Mar Vista Venice Boulevard safety improvements, responses were mixed, with LADOT reporting a majority of comments were positive. 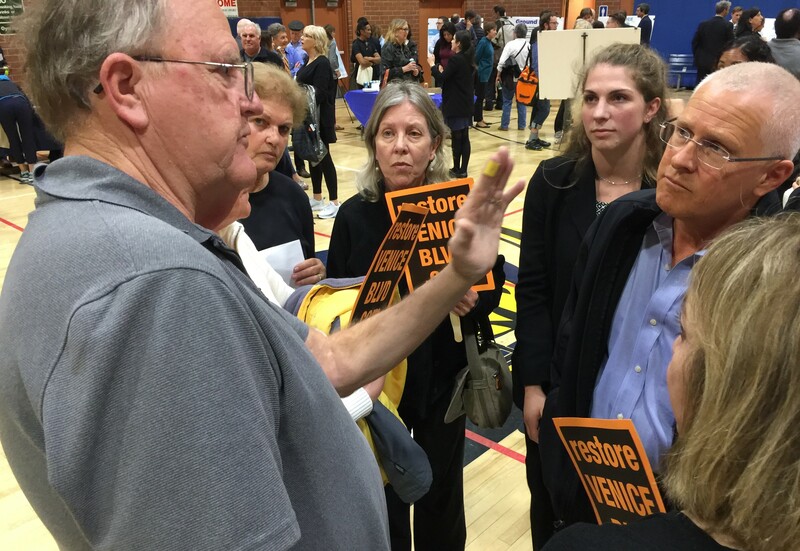 Last night, before a standing room only crowd, the Mar Vista Community Council voted to keep in place recent Venice Boulevard safety improvements, including protected bike lanes and a road diet. The data is in - Mar Vista's Venice Boulevard Great Street pilot will remain in place, with some small additional improvements planned.